Sunseeker Motor Yachts Southampton FC. Sunseeker International the award winning luxury yacht builder recently announced the following “Sunseeker International are delighted to announce they have become an official partner of local premiership football team Southampton FC. Sunseeker will be supporting the Saints’ journey in the highly competitive Barclays Premier League for at least the next 3 seasons. The agreement includes Sunseeker branding on the clubs newly-installed luxury dugout seats, which fans got their first look at during Saturdays game against Wigan Athletic. 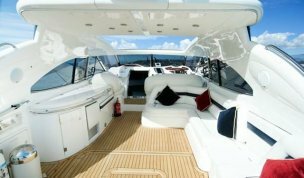 As well as on the interview boards which ensure the global television audience the premiership attracts gain exposure to the famous Sunseeker brand”. Nicola Cortese, Executive Chairman of Southampton Football Club, said: “I believe that our new partnership with Sunseeker is based on a set of shared values and beliefs. “Both companies strive to achieve the very best, and are constantly seeking to cross boundaries into fresh territory. Solent Marine Events are a premier events company since 2000. Solent Marine Events are delighted to be associated with Sunseeker International and Southampton FC premiership club. For corporate events and private parties on luxury Sunseeker Motor Yachts contact Solent marine Events. 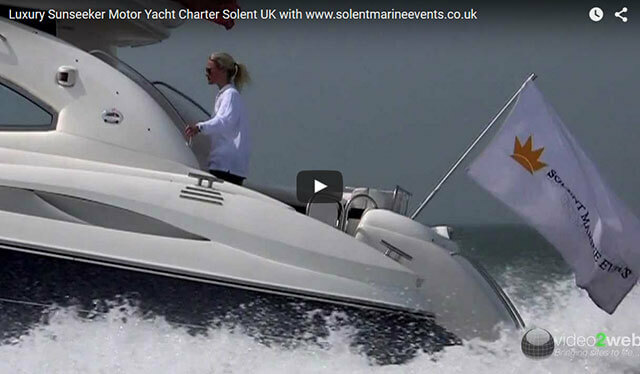 Solent Marine Events are a premier events company since 2000. We specialise in Sunseeker Motor Yachts for corporate events and private parties. Contact Solent Marine Events on 0845 689 9887 or Request a Quote today. You're only 2 clicks away from your Solent Marine Event!